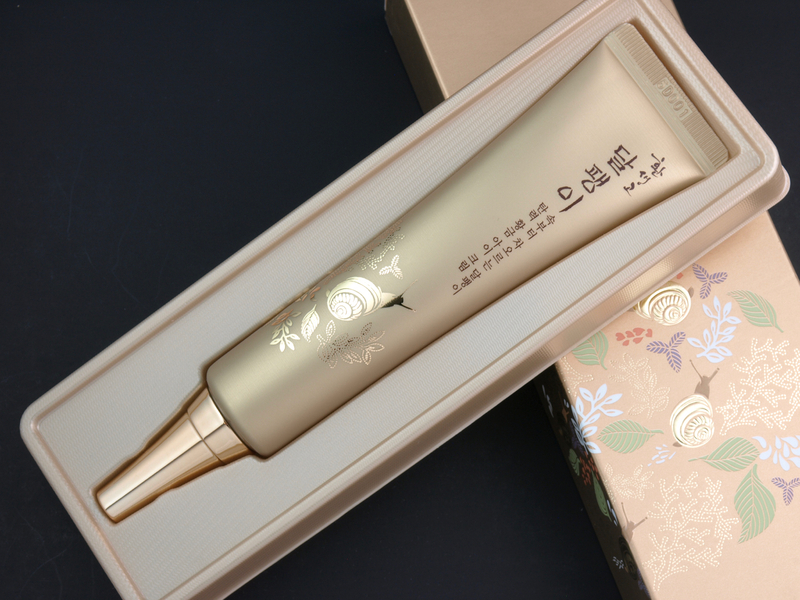 The Hwansaenggo Escargot Golden Firming Collection is definitely in the higher price range of the THEFACESHOP's catalog, and that really shows in terms of the collection's packaging. Both the cleanser and the eye cream come in a relatively simple squeeze tube but the serum, toner, and cream are all housed in very luxurious packagings. The serum and toner come in pump-dispenser bottles and the cream comes in a large jar. 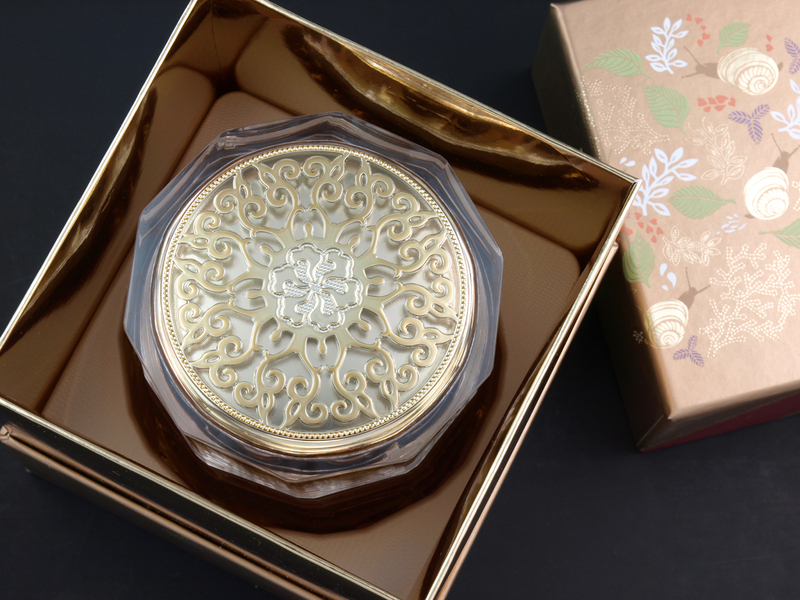 All the lids have an elaborate golden floral design set within and everything just feels super ornate and fancy. 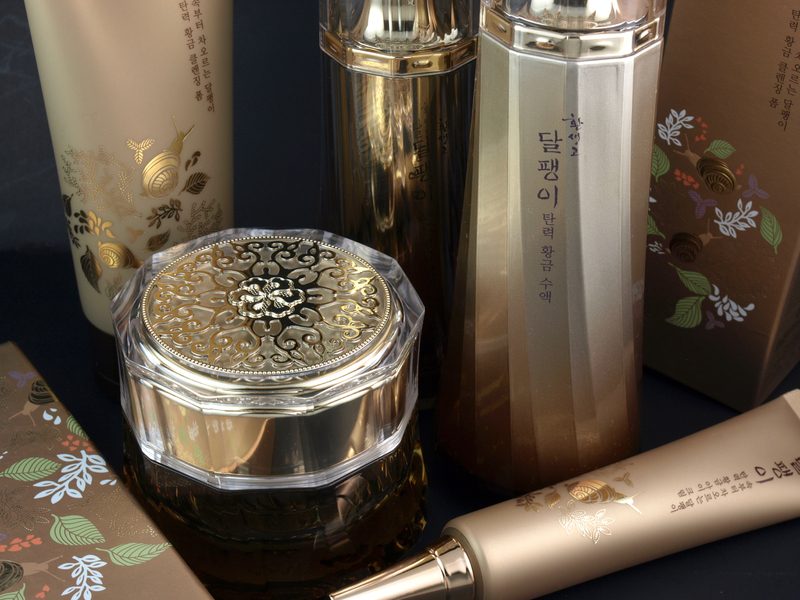 Everything in the Hwansaeggo Escargot range is formulated with snail mucus extract and 24K gold. 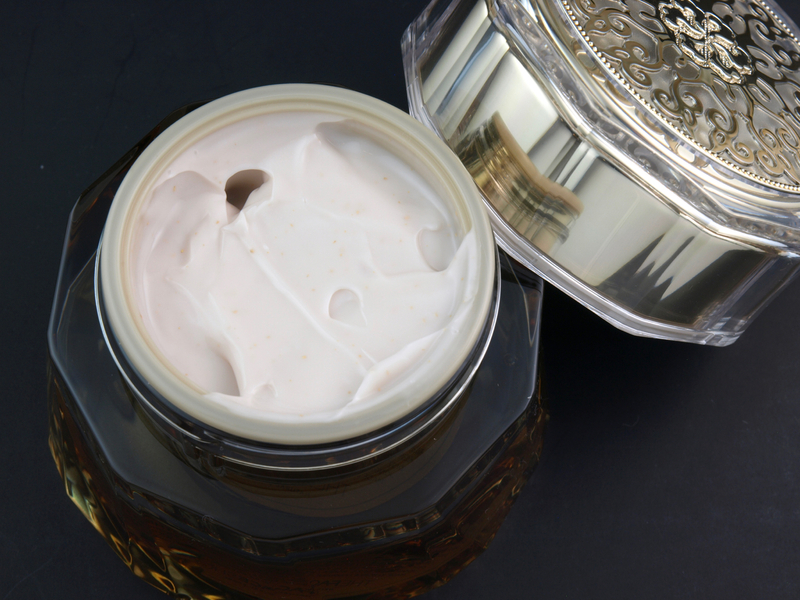 Snail mucus, which may seem like a bizarre skin care ingredient on the Western market, has become quite popular in the Asian skincare world in these past several years. Promising "healing, moisturizing, and anti-aging properties", snail mucus contains mucin (provides hydration and protection), allantoin (promotes moisturization and skin renewal), collagen, elastin, and glycolic acid (gentle exfoliant that boosts skin cell regeneration). 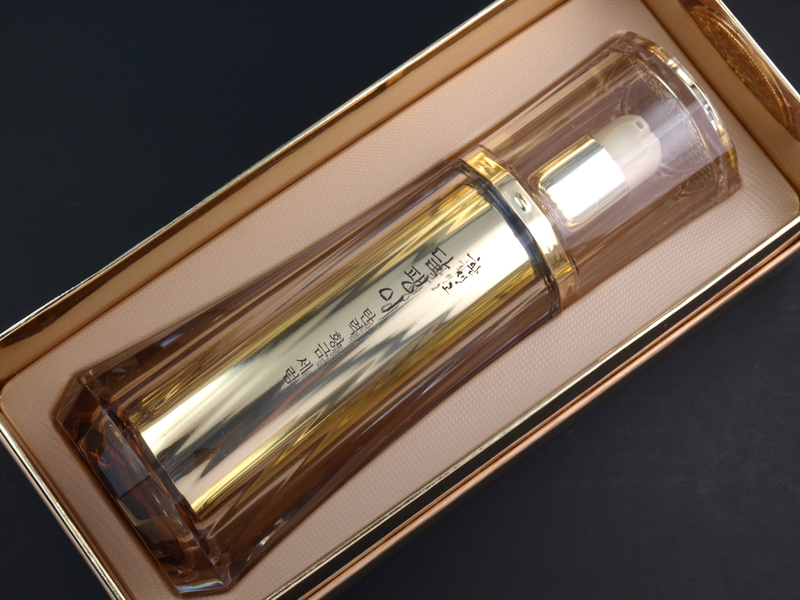 24K gold, on the other hand, promises to detoxify and improve skin cell turnover rate. There seems to be a lot of disagreement over the true benefits of gold on the skin so I am not really sure if it really provides a noticeable difference for the skin. A super foamy cleanser, the Hwansaeggo Escargot Cleansing Foam lathers like a dream. A little goes a long, long way, so only a pea-sized squirt is needed for a full-face cleansing. 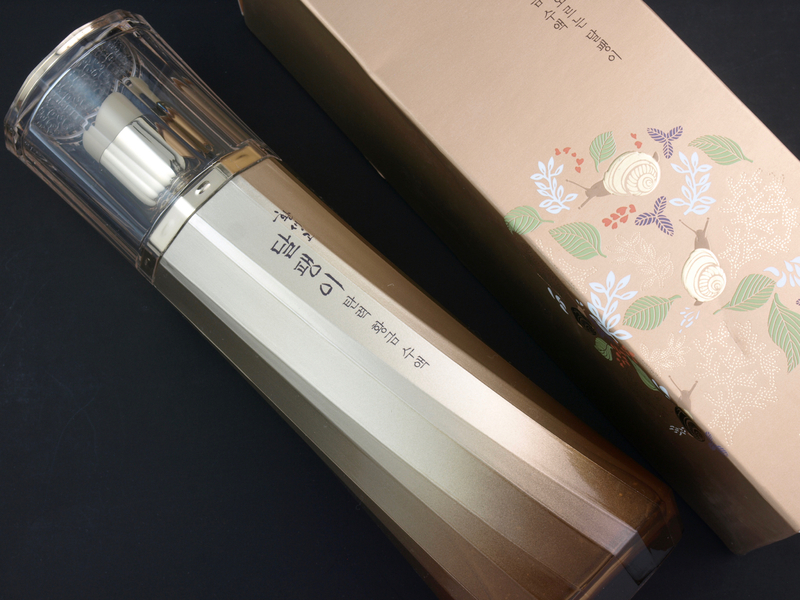 This cleanser is super gentle yet effective and unlike a few of the other THEFACESHOP cleansers I've tried in the past, the Hwansaeggo Escargot Cleansing Foam does not leave behind any residue. My skin feels super soft and supple after cleansing, this is definitely one of the nicest foaming cleansers I've tried! 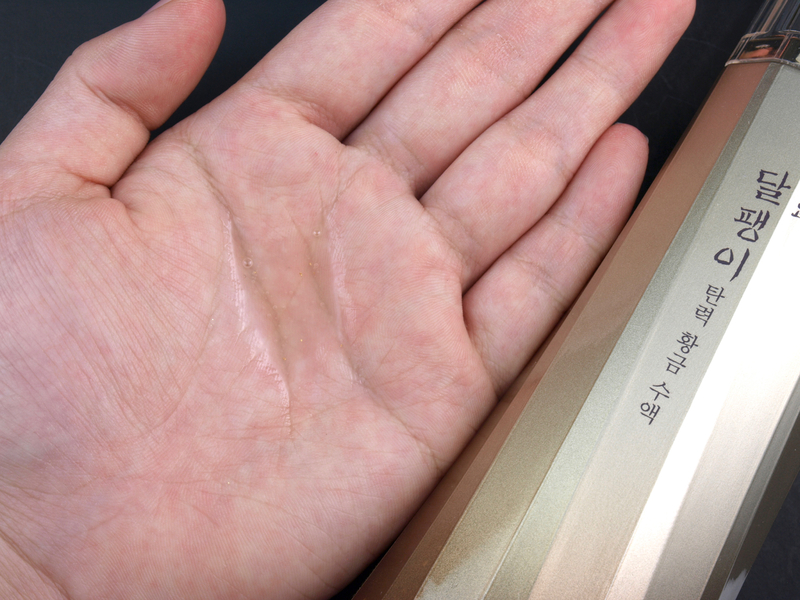 With a fairly viscous texture, this toner applies best by using your hands versus a cotton pad. The formulation has tiny gold bits floating throughout and the texture does feel a bit mucus-y and sticky. I found the absorption a bit slow; I actually had to pat my skin gently in order to get everything settled in. 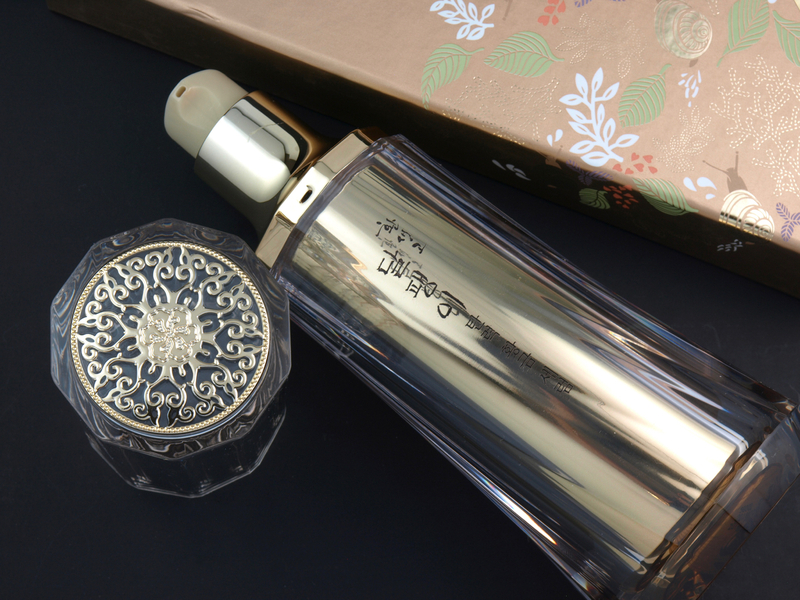 The gold leaf bits simply disintegrate after the toner is rubbed into the face. This toner indeed has a firming effect; my face feels slightly tightened once the toner completely absorbs but the finish it leaves is a bit tacky. Additionally, the toner kind of made my skin itchy, which I did not experience with any of the other products in this line. I wouldn't call it irritating but something in the formulation made my skin temporarily sensitive. 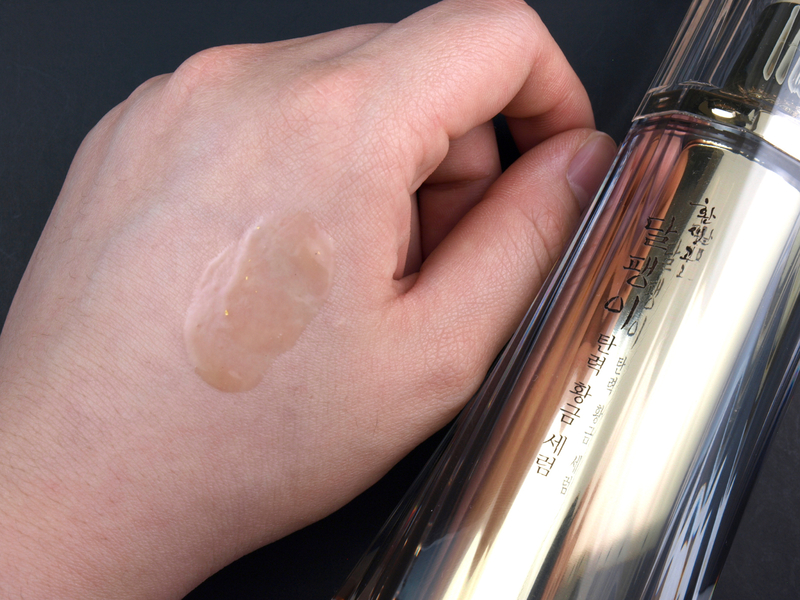 Unlike the Hwansaeggo Escargot Toner, the serum did not have a sticky finish. 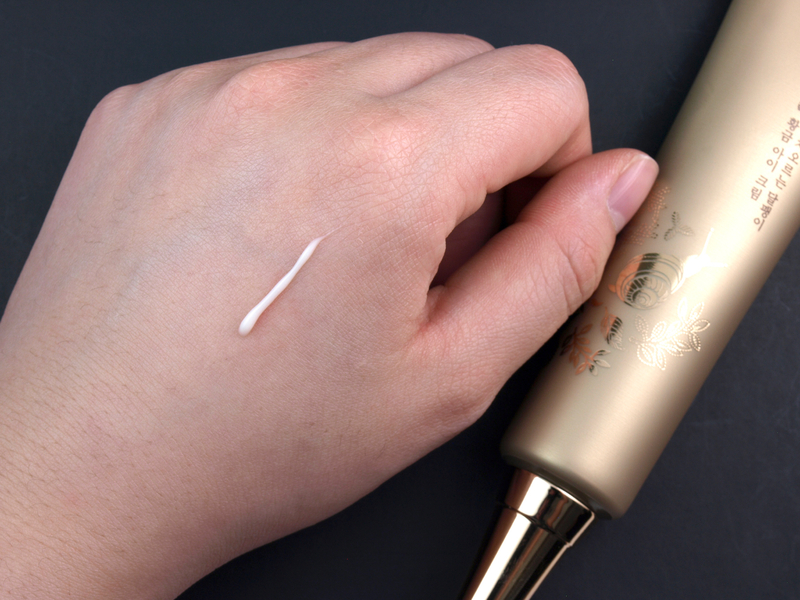 With a viscous gel formulation that's scattered with bits of gold, the serum absorbs very quickly and provides a light hydration. This one doesn't have a firming sensation but it's soft and comfortable on the skin, and when paired with a face cream, it provides some extra moisturization. Probably my favorite item out of this collection, the Hwansaenggo Escargot Eye Cream has a very unique formulation. Unlike your typical eye cream, this product has a very strange but pleasant mucus-y formulation. The cream dispenses from a tiny spout and it feels really around the eyes; it is deeply moisturizing without feeling greasy or heavy. 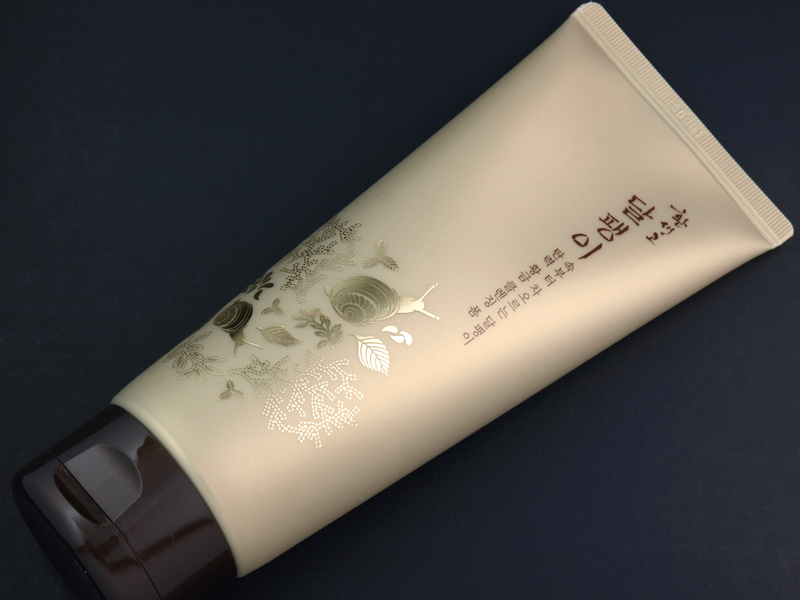 Aside from snail mucus and gold leaf bits, this face cream is also formulated with macadamia oil and shea butter. The formulation is very light and airy; it absorbs quickly and provides long-lasting hydrating. The texture isn't greasy and the finish is very natural. I've been using it as a night cream and I like how it makes my skin nourished and refreshed in the morning. Overall, this is a very lovely and luxurious collection from THEFACESHOP! The eye cream and cleansing foam are my personal picks as both provide a standout result. I'd never thought I'd say this, but snail mucus works surprisingly well at providing long-lasting and lightweight hydration! Who'd have known?